Founded in 2002, Boomerang Books is Australia's online independent bookstore, with a distinct focus on Australian books, Australian authors and Australian publishers. Tag: Where does Thursday go? In an illustrious and diverse career in children’s books Australian author Janeen Brian has written across genres and forms. Her books span novels, series, picture books and non-fiction. Thank you for speaking with Boomerang Blog, Janeen. Thank you very much for inviting me. Where are you based, what is your background and how are you involved in Australia’s children’s literature community? Home for me is in a seaside town called Glenelg in South Australia, about twenty minutes from Adelaide. Originally a primary and junior primary teacher, who worked for some years in a small school library, I began writing for pleasure some time in my thirties, having not ever considered writing before. My career, although I didn’t know it at the time, began when I was lucky enough to start writing for an educational publisher. Since then, I have written over a hundred books, which include educational titles. 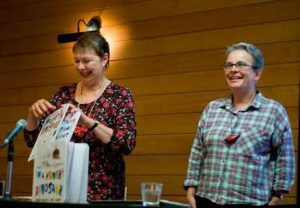 Writing communities and Writers’ Centres were thin on the ground when I began, so when a group of children’s writers, calling themselves Ekidnas, and a Writers’ Centre was formed in Adelaide, I felt lucky to suddenly find myself among like-minded people. It was probably a turning point for me. I am still involved in Ekidnas, and am a member of SA Writers’ Centre, ASA, IBBY, SCWBI, SBCASA Branch and was, up until recently, on the selection panel for The May Gibbs’ Children’s Literature Trust Fellowships in South Australia. 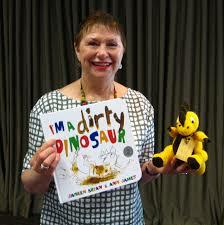 I’m also an Ambassador for the Little Big Book Club (Raising Literacy Australia) and the Premier’s Reading Challenge. How have you been mentored by the Australian book industry? Are you able to mentor others in the industry? There is no doubt in my mind that any workshop, festival, reading or other type of literature event I’ve ever attended has had an impact on me. And nourished me. So that would be my experience of industry mentoring. Plus I was fortunate to win a Carclew Fellowship (Adelaide Festival Awards for Literature) in 2012, which was a type of financial mentoring! My own mentoring would be in the form of workshops and author visits to schools or libraries. However, I once mentored a lady who was interested in picture books, in a one-on-one situation. Who publishes your books and which illustrators have you enjoyed collaborating with? I am published with a wide variety of publishers, and one reason for that might be that I write across a broad range of genres. My publishers include Penguin Random House Australia, Allen & Unwin, Walker Books, Scholastic, Omnibus Books, National Library of Australia, Little Hare/Hardie Grant Publishing, Five Mile Press/Bonnier Publishing Australia and most recently, Little Book Press (Raising Literacy Australia). I’ve had the most collaboration with illustrators Ann James (I’m a dirty dinosaur and I’m a hungry dinosaur) and Anne Spudvilas ( Our Village in the Sky and Where’s Jessie?) and enjoyed enormously working with both of them. I think Pilawuk–When I was Young (published by ERA Publications) is an enduring information books for teachers and in classrooms because at the time of writing it was one of the earliest titles about The Stolen Generation. It also was an Honour Award winner with CBCA. 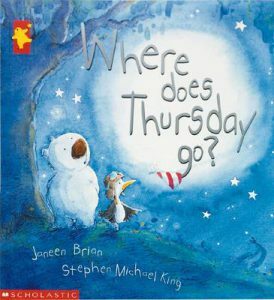 Another Honour book, published in 2001, was the very popular picture book, Where does Thursday go? (illustrated by Stephen Michael King and published by Margaret Hamilton Books/Scholastic Australia). It’s since been published in UK, translated into 11 other countries and recently enjoyed yet another reprint. I’m also an award-winning poet. I also enjoy writing verse at times and Silly Galah! 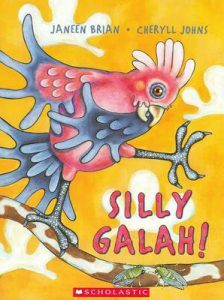 (illustrated by Cheryll Johns and published by Omnibus/Scholastic) is still a popular book, featuring humorous, informative verses about Australian animals and birds. Its recent follow-up is Silly Squid! by the same illustrator and publisher, which highlights Australia’s sea life. 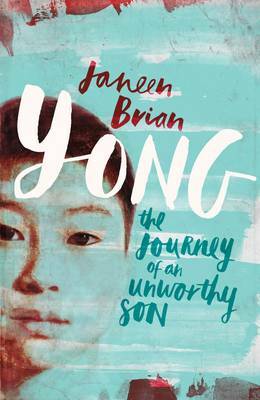 My two historic novels, That Boy, Jack and Yong; the journey of an unworthy son, have both proved very popular and are also read as class sets in schools. 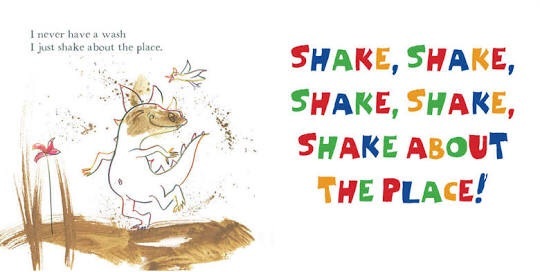 My two dinosaur picture books, I’m a dirty dinosaur and I’m a hungry dinosaur (illustrated by Ann James and published by Penguin Random Australia) have been runaway successes. The former won an Honour Award, was Winner of 2014 Speech Pathology Awards of Australia and is the book selected for many Early Childhood Reading programs, targeting families, nationwide. (eg. First 5 Forever in Queensland) It’s also been published in China. The latter was a Notable Award. What awards have they been shortlisted for or won? I have been shortlisted or won Notable awards for other titles including, Eddie Pipper, Where’s Jessie? and Little Chicken, chickabee. How do you keep your non-fiction so interesting? Thank you for that kind comment. Because I read less non-fiction than fiction, I’m aware that in order to interest certain readers, I first have to interest myself. Over the years I’ve come to believe, that factual information which is written in a more narrative or story-like style is more accessible and interesting for readers such as me. I also try to include fascinating details, using the child-in-me to help decide which to choose. I know that good books often inexplicably go out of print. Which of your books have stayed in print for a long time? Which haven’t? How have you tried to keep any of your books in print? Is there anything we can do to keep good books in print (apart from buying them)? That’s an interesting question and one which is out of the author’s control. A publisher determines the when and why a title will not be reprinted. The bottom line is usually sales figures. Many of my educational titles are out of print, but many also remain in print. Often educational and trade publishers change focus or decide to drop a series. Apart from Hoosh! Camels in Australia, which I now reprint and distribute, all other titles mentioned above are still in print. Constant promotion, seeking out niche markets, looking to digital printing and reprinting through Print on Demand are a few ways to potentially keep good books out in reader-land. The creator must work in collaboration with the publisher or look at alternative publishing ideas to keep their book afloat. Do you give many presentations to children? How do you make them interesting? Have there been any particularly memorable responses? Like many children’s writers who’ve been publishing over a number of years (for me, approximately thirty-five years) I’ve given thousands of presentations. I like to be super-prepared, have lots of artefacts, objects, interactive ideas to get the children involved, puppets, songs, creating rhymes, music or rhythm making, choral chanting, dress-ups, role-play, visual material, and nowadays, powerpoints. It all depends on the age-group of the children I’m presenting to. I ALWAYS read to the children. That is a given. And I include poetry reading too. Often we’ll act out one of my poems as I read it. I believe strongly that when an author reads their own work to an audience, a little bit of magic comes out in the words. One memorable situation wasn’t a presentation as such, but it has always stayed with me. A Year 7 boy in a co-ed college in Adelaide won a competition for a piece of his writing. He decided to spend part of his prize-winnings purchasing an extra copy of my book, Where does Thursday go? for the school library, because it had been his favourite book when he was young. If that was not enough, the teacher-librarian invited the boy, his family, all the library monitors and me to a beautiful morning tea. And I read the book aloud to the boy, and all who were seated at the table. How I got through the reading without crying, I’ll never know. But there were tears in the librarian’s eyes. I think the one of the biggest lessons I learned was that if you have the desire, the passion and the tough skin to write, that it is a craft – and therefore can be improved. The strange thing was that I had never in my wildest dreams set out to be a writer. I loved reading. And I loved reading other people’s books. I enjoyed English at school, but there was never any huge encouragement or spark in me that urged me to become an author. So learning was and still is, a big factor in my writing life. 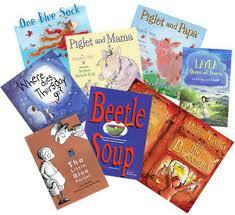 At first I enjoyed writing picture books, poetry and short fiction. And I’ve written over 200 poems, stories, plays and articles for The School Magazine, but of late, I’ve extended my writing loves to include novels. I have also written several teenage short stories for specific anthologies, and although I enjoy writing short stories, my preferred age group is younger, babies to upper primary. What are you writing about now or next? I was overseas for four months of this year, returning in July, and while I was away I wrote several poems. The School Magazine has already accepted one. I have also finished a picture book and the first draft of a children’s novel. I’ve sent the picture book to my agent but the novel is safely under lock and key so I don’t look at it for a month. I have a tendency, or bad habit, to send out texts too early! What have you enjoyed reading recently? Finding your own voice and style takes time, a lot of writing and a lot of rejections. Everybody has different writing interests. Everybody chooses whether to plot OR to free-wheel-write as a ‘pantser’ OR use a combination of both. Writers often go about writing each book differently. Thanks Janeen, and all the best with your wonderful books. Janeen Brian is the much-loved, award-winning author of over 90 books for children, many of which have been translated and distributed around the world. Some of her most popular titles include I’m a Dirty Dinosaur, I’m a Hungry Dinosaur, Where does Thursday go?, That Boy, Jack, I Spy Mum!, Hoosh! Camels in Australia, Silly Squid! and Pilawuk- When I was Young. 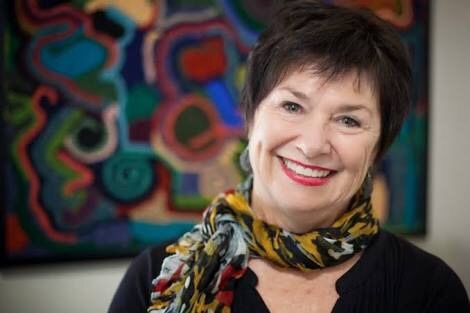 Janeen is also widely known for her wonderful contributions to the industry, winning the Carclew Fellowship 2012, being Ambassador for the Premier’s Reading Challenge, and presenting at a number of conferences and schools. 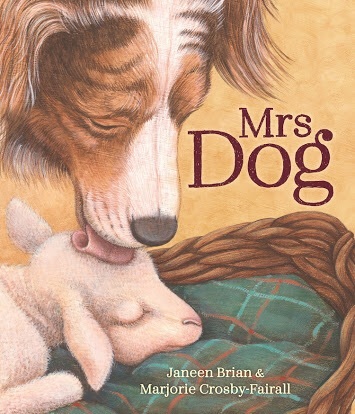 It is an honour and thrill to have had the opportunity to find out more about Janeen and her latest gorgeous books, Mrs Dog, Where’s Jessie? and Our Village in the Sky (reviews here). Where did your passion for books and writing children’s stories begin? Are there any particular books or authors that have played a significant role in where you are today? I think the passion was always there. I can’t remember a time when words and stories didn’t fascinate me. The sound and power of words has always intrigued. However, we were a book-poor family. And I went to a book-poor school. It was just how it was. I now realise I’ve always carried that ache inside of me. So, I guess it had to come out somewhere, sometime. I’m grateful it did. I would probably credit becoming a teacher and having daughters of my own with the eventual, tentative, stepping out into the children’s writing arena. But I also had a couple of angels in my later adult life who gave me a nudge. Without a childhood plethora of books or reading matter, I’m on a constant treadmill, trying to capture the thrill of books which are embedded in the psyche of many of my writing colleagues, for whom those books were friends. And so I swing; to read back to my childhood and forward to what is out there today. I’m constantly reading. At times, I wonder if I evaluate enough of what I read. It just seems that I’m hungry or thirsty for stories and poetry. So many authors affected me, but two who immediately spring to mind are Robin Klein and Ruth Park. Their writing touched me; it was full of exquisite detail, rich in character and expressive in language. And they spoke of our country and culture, and at times, our history. Your writing style varies between heartrending poetry, to playful rhyme and informative and lyrical narrative. Do you have a preferred style of writing? How has your style evolved over the years? I think once again it comes down very much to what pleases me, particularly aurally. I don’t have a particular favourite way of writing. I write in the style that suits the work. And I find it interesting that although the style might differ according to what I’m writing, people still say they can recognise my work when they see or hear it. I guess my style is like a maypole, with many ribbons attached – each one individual but connected. I think, or hope, that my style has become more honest and richer as it’s evolved. That would please me. Some of your recent books, in particular Our Village in the Sky, Where’s Jessie? and Mrs Dog, all carry a timeless feel with their beautifully lyrical language and images, as well as encapsulating more sophisticated topics such as cultural differences, loss and survival. What draws you to write with these kinds of themes? Although at times, I can feel like a suburban fringe-dweller, I have to remind myself that my life has been full of interesting twists and turns and often it is the idea of survival that is uppermost. I think that many everyday people are heroes, tackling life’s mountains. However, from different, and sometimes difficult challenges comes strength and confidence. The word used a lot today is resilience. I think I try and show that in my work. We all battle at times, in various ways, and sometimes we have to dig deep to find courage or strength to continue. Or to look at a situation in a different way. Often, too, help can come when one person takes the hand of another. I love to see a world of real things; kindness, laughter, nature, play and creativity. I’m not much of an adult in the highly commercialised world. I think all of this affects the kind of stories and poems I write – and the themes and language embedded in them. Your most recent release, Mrs Dog, is a truly moving story of unconditional love, nurturing and courage, with elements of humour and adversity blended in the mix. Did this story emerge from a personal experience? What aspect of the story is most meaningful to you? Like in most stories, Mrs Dog is a mixture of experience and imagination. Over a period of years I had collected two names. They sat around in my head for ages with no story. Over time I linked them to farm-style incidents told to me by my husband, and then changed the ideas during many drafts until the final story emerged. It certainly wasn’t one whole package to begin with. I really like the fact that when under pressure, a person/creature is often able to rise above their own expectations, as Baa-rah did in his effort to save Mrs Dog. What has been the most insightful feedback or response to Mrs Dog so far? The unconditional love and compassion shown within an unlikely inter-generational relationship. Illustrator Anne Spudvilas has provided the spectacularly dreamy artwork for both Where’s Jessie? and Our Village in the Sky. How did the pairing come about? How do you feel her illustrations complement your words? Were you able to work closely on each book? In both instances, I was able to work closely with Anne, which is not the usual experience with author and illustrator. Often seeds are sown many years before eventualities and this was the case in our first collaboration, Our Village in the Sky. Anne and I had become friends through many creator-style catch-ups, and she liked the photos and experiences I told her of my stay in the Himalayan mountains. When I later applied for a Carclew Fellowship for the 2012 Adelaide Festival of Literature, I devised a picture book of poems as a potential project and asked Anne if she’d illustrate. Fortunately I won the award, and in a serendipitous situation, Anne took her sketches and several of my poems to Allen and Unwin, who subsequently published the title. Anne was able to use images from my photos to create her scenes and characters and we worked closely on the layout and flow of the book, with me making several trips interstate. 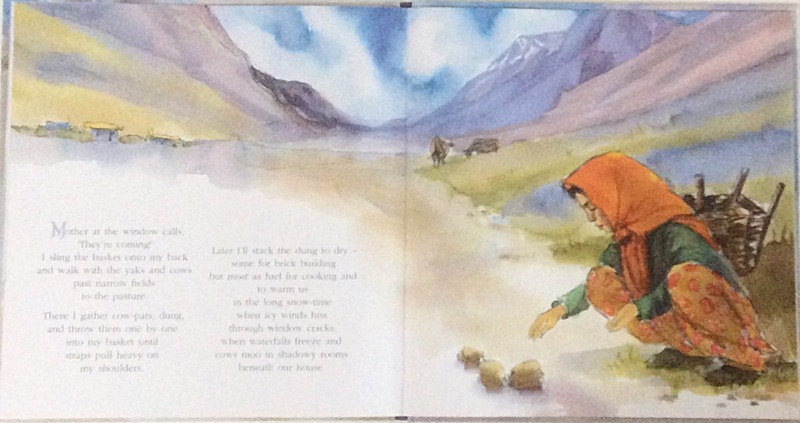 In both books, Anne’s palette and style suit the stories perfectly and I am full of admiration for her work. It evokes both emotion and sensory appreciation. Where’s Jessie? is a story triggered from the sighting of a real teddy bear that’d travelled to the outback on a camel. Because I’d earlier researched and written an award-winning information book, Hoosh! Camels in Australia, I was able to provide Anne with much visual material. Anne could also access the historical database of Trove in the National Library of Australia. There was story collaboration, too, when Anne suggested changing the character of the person who eventually finds Bertie, from an Afghan camel boy to an Aboriginal boy. Where’s Jessie? is based on the real life travels of Bertie the bear through the outback in the early 1900s. What was it about Bertie’s story that caught your attention? What was it like to research, and how did you feel meeting the daughter of Bertie’s owner? While visiting a country Cornish Festival in South Australia in 2011, I entered a church hall to view a collection of historic memorabilia. The real Bertie bear was seated on a chair, looking slightly tatty but well-loved. The note attached mentioned two facts; he was 101 years old. And he’d travelled to Alice Springs by camel. What a thrill! I had no idea of what I might do with that information, but I was finally able to track down the now-owner, the daughter of the original-owner, who’d been a baby at the time she’d received the bear. I’d had enough experience in the outback (flash floods, included) as well as my earlier research with camels, so it was really the story I needed to work on. 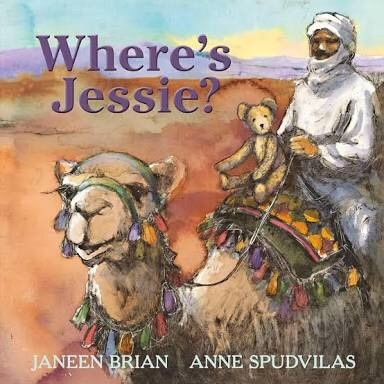 At the launch of Where’s Jessie?, the now-owner spoke movingly about how well-loved the ancient bear still is within their family; citing that he is still the comforter of sick children and the soother of bad dreams. 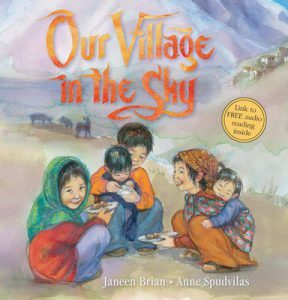 Our Village in the Sky is beautifully written in angelic language that reflects the perspectives of different hard-working, yet playful, children in a remote village amongst the Himalayan mountains. This book is based on your observations whilst living there. What else can you reveal about your experience? What was the most rewarding part about writing this story? I felt compelled to write about this village, and particularly the children, because I was able to interact with them at the time, using sign language or games. Or I simply watched them. Only a few villagers spoke any English at all, and it was very minimal. Culturally, and because of the language barrier, it was not possible for me to ask about many things pertaining to women or family life. So my focus was the children. I noted and photographed. I wrote a diary of my feelings and thoughts. But, back home, when I came to write, it was the children I wanted to write about. The images in my mind decided that the ‘story’ would be a series of poems depicting their life, so different to children in the Western world. The most rewarding part was the connection I felt through the words, and that I had acknowledged my experience in that area of the world. What do you hope for readers to gain from this book? Curiosity. Understanding. Awareness. And being able to relate to the child-like aspects in each poem. 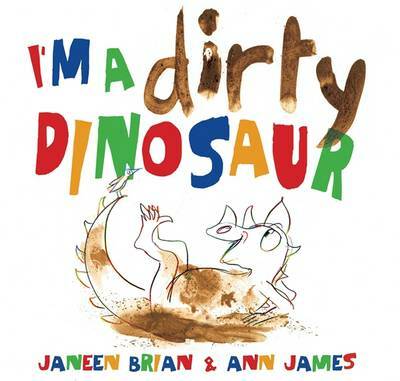 Can you please tell us about your working relationship with illustrator Ann James on the I’m a Dirty/Hungry Dinosaur books? Was this collaboration any different to any other of your author-illustrator partnerships? Ann and I had been published together in a book called Dog Star, an Omnibus/Scholastic chapter book in the SOLO series and we’d become friends mainly through catch-ups at various festivals and so on. At one festival at Ipswich in 2009, I asked Ann to consider a poem I’d written. It was called I’m a dirty dinosaur. Over discussions, Ann agreed to illustrate it and with the poem and a few sketches the material went first to my agent, Jacinta di Mase, before it was picked up and published by Penguin Australia. (now Penguin Random House Australia) Ann and I chatted about the text and pictures throughout the process, just as we did with the second book, I’m a hungry dinosaur. Both books have been a lovely culmination and collaboration of ideas. What were the most rewarding and challenging aspects of creating the ‘dinosaur’ books? Working with Ann is a joy. She is alive with ideas, energy and enthusiasm. We both enjoy the playfulness of the books, and the act of play and fun with language is important to both of us. Ann also likes to minimalise her line work to give the maximum effect and I think she’s done this brilliantly in both books. I also like to hone down my words so they shine without any extra unnecessary baggage. There’s also an integral trust between the two of us, which is wonderful. The challenge came in the second book. It’s not an unusual dilemma. The first is the prototype. The second must follow the format yet still have its own life. We believe we achieved that in I’m a hungry dinosaur! If you could be any kind of dinosaur, what would that be and why? I guess if I could be any dinosaur it would be the one Ann created! As an experienced author, what advice would you give to those writers just starting out? Apart from reading and writing, I think it’s interesting to write down passages from other authors’ books. Writing slows your thinking down. You might enjoy reading the passages, but when you write them down, you are considering the authors’ motivations and reasons for writing those particular words. You might notice more fully the effect those words have. You might feel the pull of a different style, which could loosen your own, stretch it or challenge it. Finding your own voice can often take a long time. But playing around with other people’s words can sometimes be quite surprising. Work hard. Understand that writing is a craft. As such, there is always room for improvement. And improvement brings you closer to publication. And finally, if you could ask our readers any question, what would that be? Thank you, Romi. Your wonderful, thoughtful questions were much appreciated. Janeen Brian can be found at her website, Facebook and Twitter pages. Q Who is Janeen Brian? Describe your writerly-self for us and the thing that sets you apart from other Aussie children’s authors. The introspective part of me used to struggle in earlier days, because I had no pre-formed vision or identity of myself as a writer. I knew little about writing. Yet I quite liked to write. I knew little about books. Yet I liked to read. I’d never known about how to deconstruct, analyse or evaluate writing or reading and I can’t remember getting much of a grounding of it in high school, but I’m sure I must’ve. In my later years I tentatively did a TAFE correspondence writing course and dipped my toe in a weekend writing workshop. Although I did write for adults and enjoyed it, (short stories and poems), I discovered it was really where my heart was. I felt better connected with a children’s readership. People say that when they read my work, they see pictures in their head and that pleases me, because I try to write pictorially. They say my work reads aloud well. That pleases me because I like the music of language and the sensory world of words. Reviewers often make the comment that I ‘know what children want’ and that pleases me because it’s what I strive for. I also write a lot of poetry, enjoying the capture of a particular moment to provide a shortcut to the emotions. Perhaps poems, picture books and short fiction is where I fit best. Q You are an experienced writer covering many styles and formats, including TV scripts. What is your favourite style of writing, why and does it result in your best work? I am experienced in that I’m been writing for about 30 years and of those, 23 years have been fulltime, but I never stop learning and trying to improve. I’m sure I’m not the only author who says that! But I enjoy different styles and formats because it challenges me, and I find different aspects to my writing emerging that may have remained untapped. During my writing life, I’ve tried to seize any writing opportunity and that included writing eleven scripts for Here’s Humphrey, a pre-schoolers program. While I loved the content and age group, I felt that ultimately the fast-paced nature of scriptwriting for the media wasn’t quite me. When the show drastically changed format, I wasn’t asked to write any more scripts, so perhaps the producer felt the same! I like researching and have written much non-fiction. When I write information articles or books, I try to write simply, so children grasp concepts, and also hopefully in a visual or anecdotal style, so information is more readily absorbed. I do this, because I don’t absorb facts very easily! As mentioned in the earlier question, I think I do my best work with shorter pieces, though I’m very proud to have written several novels and to have had them accepted and published. Q At what stage in life did you realise you wanted to write? What, whom persuaded you to continue? Was it always this way or did you aspire to be something different as a kid? Nothing struck me on the head to get writing! In Year Three at school, I decided to be a teacher and followed that course into Primary school teaching at eighteen. Later, around the time I had two young daughters, I simply dabbled in writing for my own enjoyment. I’d never been a closet writer or held dreams of one day writing. I simply began to write every now and then; mainly poems for my girls or to give away as gifts. Then, on becoming a single mum, I began to use my writing to earn extra money; penning small articles in magazines. I was also asked to write some scripts for a children’s theatre company, which was a big ask as I’d had no training or real understanding of the constructs of theatre. But I did it. I think one show was a flop but the others were okay. So, I beavered away, joined the SA Writers’ Centre, met a kind, experienced author who became my mentor and life-long friend, and who provided much needed encouragement and practical advice. Then I was lucky enough to have books/readers accepted by an educational publisher, which I think gave me good training in crafting to a brief and culling floppy, useless words. Q How have your refined your craft? Did you study, if so where, and do you feel this has attributed significantly to your work? I was persistent, imposing on myself all sorts of disciplines, real or imaginary to keep the writing muscles working and the financial side viable. I attended writers’ courses, but never attended University. My only tertiary training was the two-year teacher-training course. I read books on writing, obtaining my first loads from libraries, then purchasing more and more myself, all the time reading and trying to improve my writing. At that time, there was no computers or websites, no online blogs or author chat lines. I stuck to my simple, personal credo, If it’s to be, it’s up to me. Joining and meeting with a group of South Australian, published children’s writers and illustrators, called Ekidnas, helped me and my writing immensely. It wasn’t a critique group, more a support group, providing encouragement and networking opportunities in the days prior to email (doesn’t that sound amazing?). Now we meet approximately four times a year, but have an Ekidna website of our own, which is updated weekly and highlights our members’ achievements and activities. Quite impressive! Q You are a published author of several titles. What are they? Which are you most proud of? Do you have any you would rather forget? By May, 2013, I’ll have more than 78 books published, some educational, the rest being trade published. I also have poems in fourteen anthologies. Here’s the website for titles: wwwjaneenbrian.com. One of the easiest books I ever wrote was a picture book called Where does Thursday go?, illustrated by Stephen Michael King and published by Margaret Hamilton. The words simply fell onto the page. 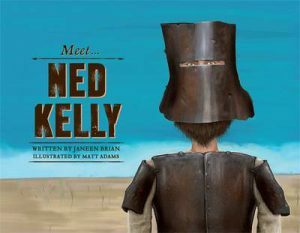 The book won an Honour Award in the CBCA picture book awards, and a Notable in the Early Childhood Awards in the same year. It then went on to be published in USA and UK as well as being translated into thirteen languages. I call it my heart book, because the idea was triggered by my then six-year-old daughter, Natalie, and I was able to dedicate the final book to her first son, my first grandchild, Liam. I still love the story, the language and the superb illustrations. Want to find out what’s on the drafting table for Janeen? See what’s in store tomorrow in Part Two of our chat with one of Adelaide’s finest children’s writers. Posted on March 6, 2013 June 29, 2015 Author Dimity PowellCategories Author Interviews, Dimity Powell, New Book ReleasesTags author interview, children's author, Here's Humphrey, Janeen Brian, pie floater, Where does Thursday go?